My husband and I moved into this house a year ago and we never knew what to do with our small spare bathroom. We decided about two weeks ago to turn it into a beach themed bathroom with flip flop decorations, sail boat decorations, and beach decor. One day we went to Lowe's and picked up a lot of paint samples from many different companies. Instead of choosing a color right away we looked over the colors for a few days and held them up to the wall in the bathroom we wanted to paint. The paint color we finally decided to use was Valspar Ocean Sigh, chip number 5002-10A. We decided on this color because it was blue like the ocean and it was not dark. We wanted a light color to make the small bathroom feel bigger. We decided on a beach bathroom because we live in Florida about five minutes from the beach. 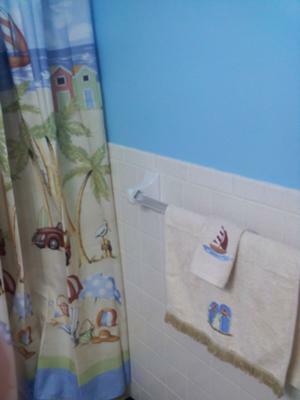 We did not want to do a traditional Florida bathroom with palm trees and shells, so that is why we decided on flip flops and sailboats. My husband and I are young, 25, so we also wanted the bathroom to fit our personalities and style. There are many retired and elderly people down here that try to influence our style but we wanted to stay true to what we liked and we are very pleased that we did. We love the bathroom and think that it turned out great! We hung up a beach picture and decorated it to fit the wall color. A tip I would give when painting a small bathroom is to make sure you have all of the mirrors, shower curtain, light fixtures, and outlet covers off before you begin. It is best to sand the walls first to make them nice and smooth and fix any imperfections in the walls before you paint them. Once the cosmetic work is done then paint away! The color you chose is great. The light shade of blue can indeed make a small space look larger. And adding flip-flops and sailboats is a nice way to accentuate the theme.